Maddie Clifton is a graduate of Salisbury State University where she studied Music Education. She is primarily a cellist who has also studied under Cecylia Barczyk of Towson University, and Arturo Muruzabal of the Netherlands Radio Philharmonic. Maddie has been teaching private cello lessons for ten years in both Harford and Cecil counties, and is currently the Orchestral Strings Director at numerous schools in Cecil County, Maryland. This has given her experience in teaching all orchestral stringed instruments, including violin, viola, and string bass to students at every level from elementary school, through middle school and high school. As a private strings teacher, Maddie has experience using various method books, but generally enjoys using the Suzuki Method. "As a music teacher, I am a firm believer that any student of any age or background has the potential for musical success, and the right to pursue it through music lessons or classes. Music is both a form of discipline and freedom, nourishing the creative spark within us all that, without music, could be extinguished." 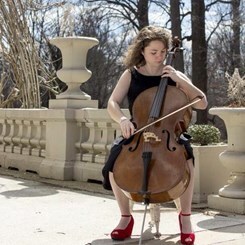 Maddie performs with several orchestra pits in the area, and is currently a cellist with the Susquehanna Symphony Orchestra, with whom she has played since 2010. Request Lessons with Madeleine today!